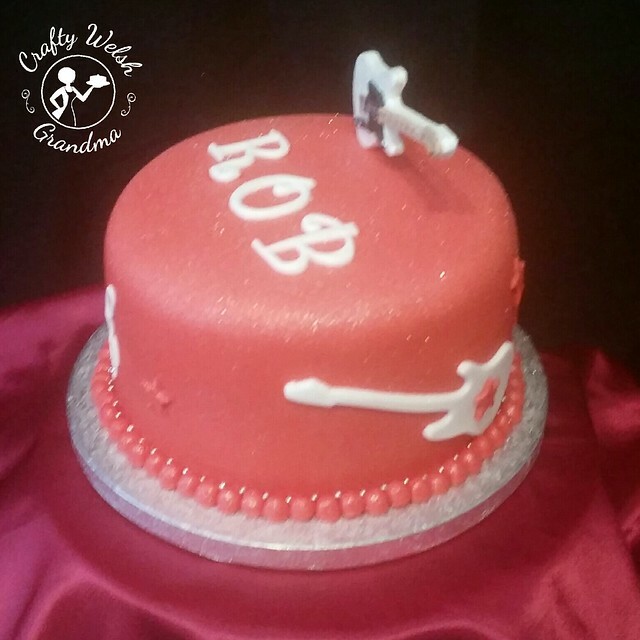 This cake had shrunk and changed shape, dramatically, from the original idea. 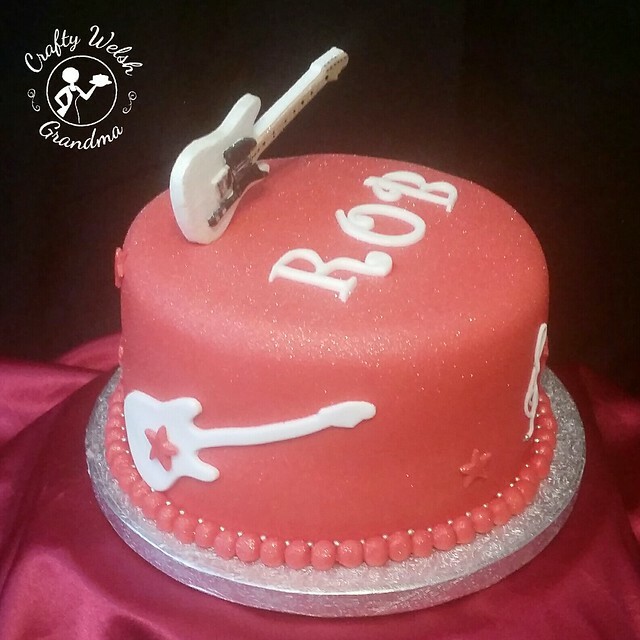 At the request stage, no size was given, just a carved electric guitar shaped cake was required. A small carved cake would have been looked completely out of proportion, so I opted for one to fit on a 20" board but, alas, following some discussion, it transpired that the cake was only for six servings. 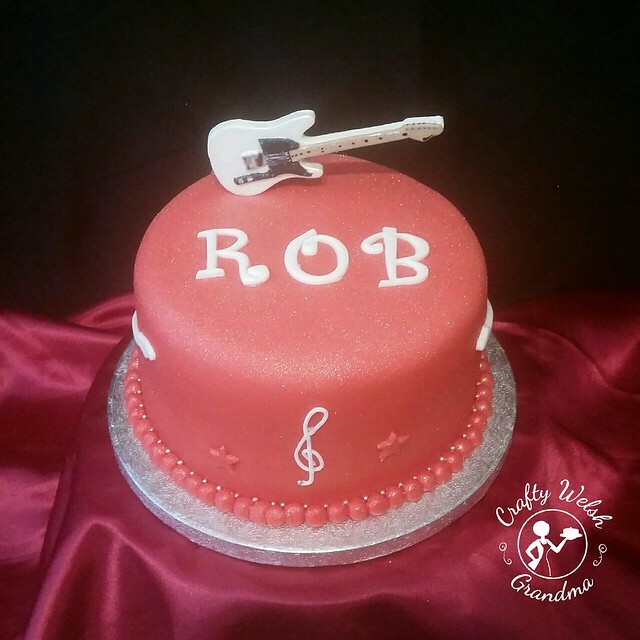 I suggested this smaller cake with a fondant guitar topper. 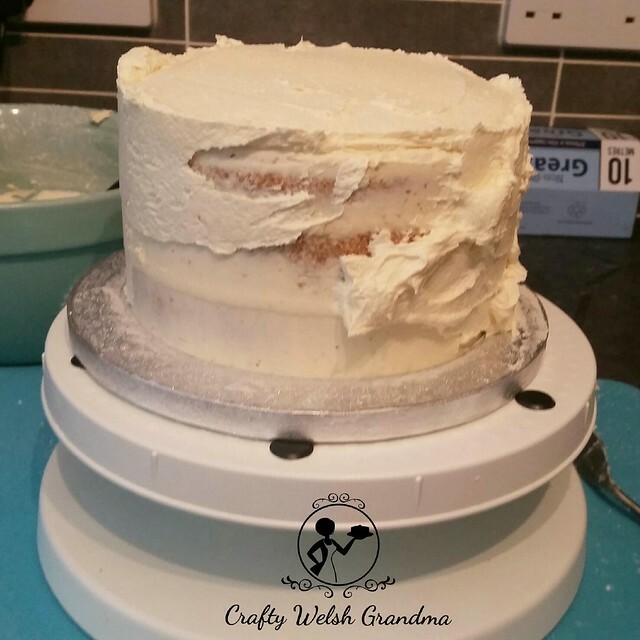 The sponge was a simple vanilla one from my faithful recipe book, sandwiched together with vanilla buttercream. As with all my cakes I guess, this one was not without it's trials! As this is only my hobby, I don't have a professional kitchen. Baking a three tier sponge cake at the same time as you're trying to crumbcoat, chill and decorate a cake is not helpful. 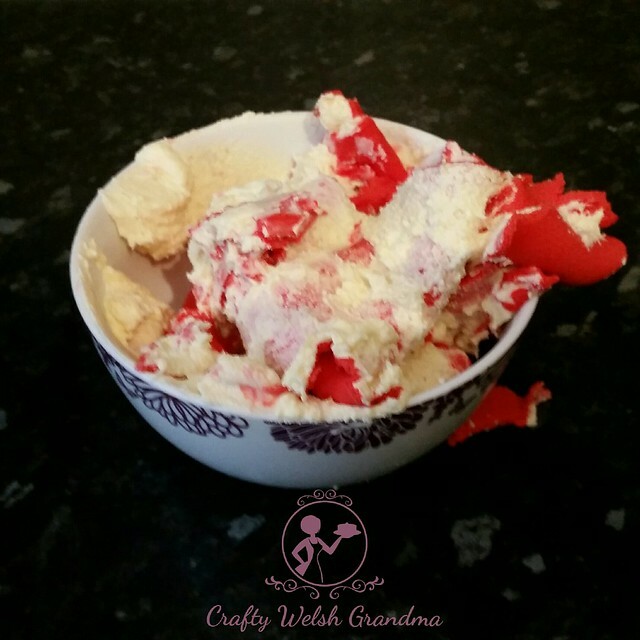 The kitchen was simply far too warm and both the buttercream and fondant became very sticky. At one stage, almost at the end, the fondant peeled off onto my paddle! But I managed! Having stripped the cake, I recovered it. My kitchen was much cooler so I had some success! I mostly cover every board, but I wanted to try something different. So I made individual fondant balls (later to have silver balls between each) to fix to the cake and board. The cake was chilled again, to prevent a repeat of day #1, then the guitar was fixed on using cocktail sticks as dowels. 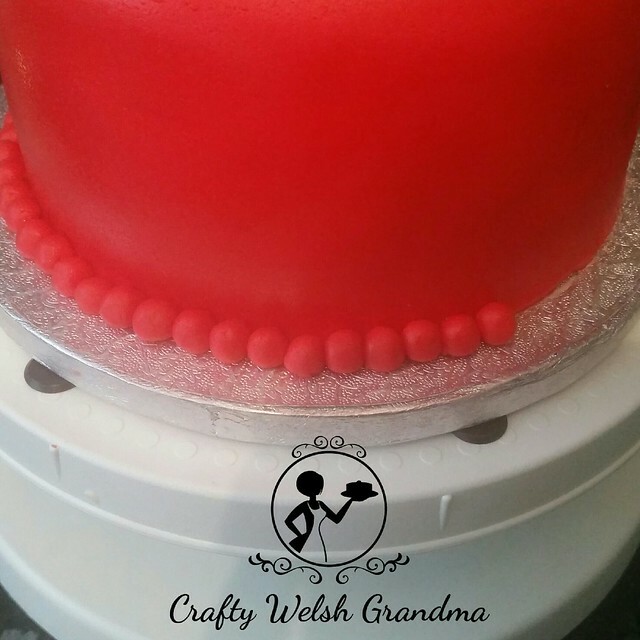 Silver balls were fixed in between each fondant red ball. 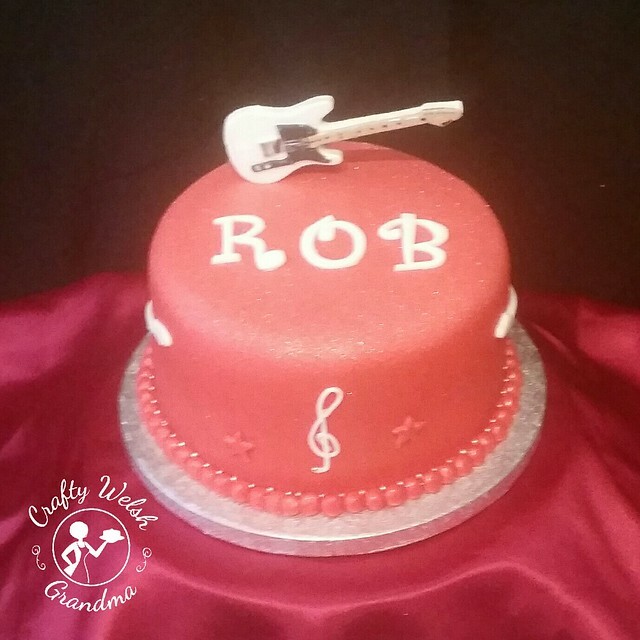 As the cake looked a little plain I cut two white guitar silhouettes, affixed them to either side, added some stars and a hand made treble clef to the front, made by using an extruder and some very thin fondant.